Volunteers pull a rubber boat with rescued passengers from the ill-fated M/V Mercraft 3 at Infanta township, Quezon province in northeastern Philippines Dec. 21, 2017. MANILA—Four people were killed and seven were missing after a Philippine ferry with 251 people on board capsized during bad weather on Thursday near the capital, Manila, disaster officials and a coastguard spokesman said. Accidents involving boats sailing between the many islands of the Philippines are common. Vessels are often overloaded but the coastguard said that was not the case on Thursday and the ferry had the capacity to carry 286 people. 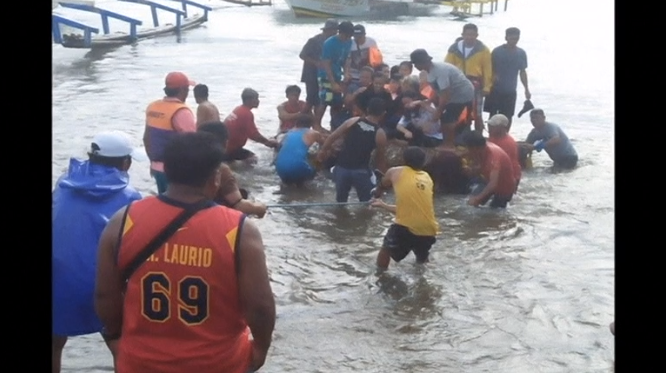 A total of 240 people were rescued from the sea by fishermen and rescue boats sent out by the coastguard hours after the ferry capsized and sank, about eight miles off Real town in Quezon province. “Search and rescue operations will continue until all crew and passengers are accounted for,” said coastguard spokesman Captain Armand Balilo. Most of the rescued passengers were brought to Dinahican port. Two men and two women drowned, he said. The ferry set sail at around dawn from a port in Real. Survivors told reporters the weather turned bad three hours later with strong winds and huge waves. The ferry began taking in water and in minutes it capsized and sank, they said. Disaster officials said search and rescue operations were hampered by heavy rain and huge waves caused by a tropical storm affecting the southern Philippines. Severe tropical storm ‘Vinta’ is expected to make landfall on the southern island of Mindanao late Thursday or early on Friday. The weather bureau has warned of extensive flooding and landslides as the storm, packing center winds of 40 mph (65 kph), approaches the Philippines.